If you’re like me you sometimes struggle to think of a different healthy, clean eating meal. Here’s an meal idea that you might like to try…. 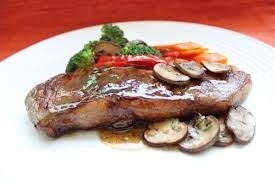 A juicy, simple steak with steamed veggies will make a good hi protein, low carb meal. Unlike the photo I’d add a lot more veggies. Remember the meat – beef, pork or lamb, perhaps should be the size of your hand and the thickness of your palm. Anything deeper than that must be green. 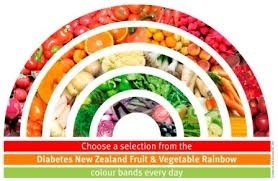 Consider the range of vegetables, you’re aiming for a rainbow of foods – so consider what colours you’ve had so far today and add the missing colours to your plate. Tomorrow I’ll have a different suggestion and another way to select your vegetables. Eat Clean, Lose Fat, Feel Great! This entry was posted in Fat Loss, Healthy Eating and tagged clean eating, Fat loss, ingredients, meal ideas, recipe of the day. Bookmark the permalink.